The rate of entrepreneurship remains near an all-time low nationally and barriers for women and entrepreneurs of color remain high, especially within the STEM community. 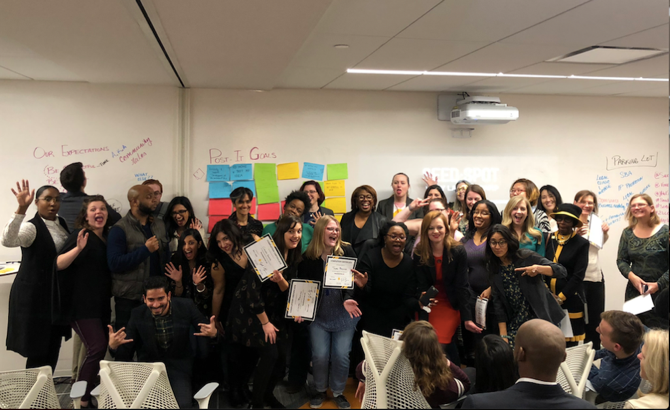 Booz Allen, SEED SPOT, AWIS, and Vinetta partnered to offer a 2-Day Launch Camp as the starting place for women entrepreneurs. This 48-hour program provided women entrepreneurs at the idea stage with a launching pad for their ventures and will be followed by in-depth mentorship from the collective network. Growth Award: Winona Francis, Gabby Levet, and Xinzi Quan, co-founders of District Connect, won a six-month membership to the co-working space at Hera Hub for tackling food deserts through a mobile grocery store. Most Viable Business Award: Dr. Carol Hirschmugl and Constance Tommerdahl, co-founders of Safeli, won pro bono legal services from Davis Wright Tremaine, LLP Legal Services for designing, developing, licensing, and manufacturing high-tech electrode materials used for electric and hybrid vehicles, power tools, and consumer electronics. Impact Award: Kimberly Lipinski, founder of Elder Nourish, LLC, won a four-hour prototyping and development session with Think Nimble for creating a service that creates and cooks customized meals for elderly people with specific dietary needs. Social Innovation Award: Michele Heyward, founder of PositiveHire, won up to $7,500 in Amazon Web Services credits for her tech company that is helping employers recruit experienced women-of-color STEM professionals for management roles. “Through this partnership, we combined the best parts of our STEM to Market (S2M) curriculum with SEED SPOT’s 2-Day Launch Camp model and the Vinetta Project’s investment in high-growth women founders to support early-stage STEM women entrepreneurs and develop them as advocates for inclusive entrepreneurship,” said AWIS Interim CEO Karene Richards. Now that the entrepreneurs have completed the in-person program, they will be supported with an after-program content campaign to reinforce the learnings during the camp, lifetime access to SEED SPOT’s National Mentor Network, and weekly alumni support newsletter with ongoing content and resources. In addition, AWIS and Vinetta will be providing ongoing mentorship and support to all the participants. In Spring of 2019, SEED SPOT will be offering an 8-Week Impact Accelerator for impact-driven entrepreneurs eager to growth their operations and impact fast. To learn more and apply, visit: https://seedspot.org/communities/impact-accelerator-washington-dc/. To read more about how Booz Allen is empowering women working in technology, see here.